My mom sent this postcard from Nepal to her sister and youngest brother in the summer of 1965 while on a side trip from India. Kathmandu is a very interesting city. When it is clear, you can see the Himalaya Mountains, but it has been very cloudy since I arrived here. Tomorrow I go back to India. 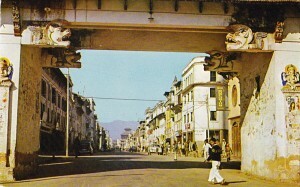 Today another lady and I are going to go to an old town near Kathmandu. Everyone I knew who traveled to Nepal in the 80s and 90s fell deathly ill with malaria-like symptoms. Some friends worried they’d never see their families in North America again. But my mom didn’t get sick there. She’s always had such fond memories of Nepal. I suspect it was a welcome break from India, as were Afghanistan and Iran, where she headed after leaving India for good. Alos I was in Kathmandu in 1965, in September. It was a weird place with hitchhikers/hippies from all over the world. Stayed in the Globe resthouse. Had travelled there via Afghanistan & Pakistan, managed to cross the Pak/In border just a day before the war broke out.